This is a joint post with Maren Deepwell (cross-posted here) continuing the story of how we, as senior staff, lead our organisation to adopt virtual operations. This category includes previous posts. Last time we discussed how we used GDPR as an opportunity to strengthen how we work as a virtual team. 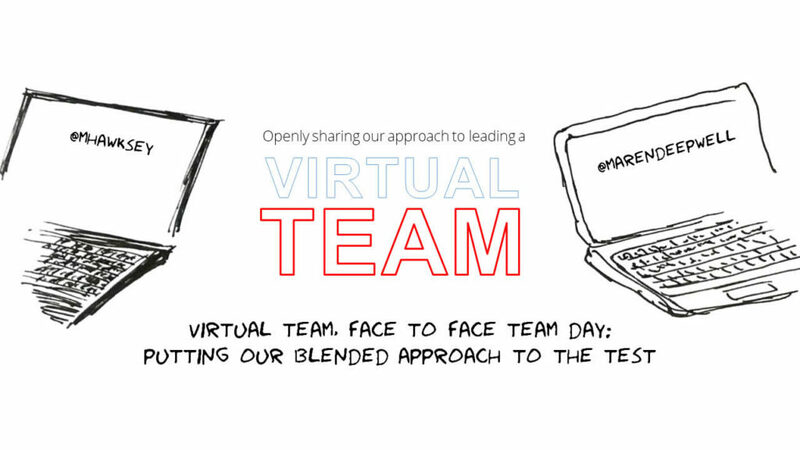 Since then we had our first face to face team day, an important milestone in creating a blended approach to running a virtual organisation. Maren: The team day was followed the next day with the meeting of the Board of Trustees, in which for the first time all of our colleagues took part. I learnt a lot from both days: for example, I had to adjust my mindset from having a ‘team day out’ (which was previously the only time we would all travel somewhere together once a year to do some team building and have a meal together) to having a day working together. Whilst that may seem an obvious point to make, it’s an important distinction to communicate to everyone involved. The agenda we set out helped us prepare and be ready to focus on the task at hand. In order to make the most of team days we plan them in different locations. This time it included a site visit to the venue for our upcoming conference. Whilst combining activities like a site visit with a day working together face to face as a lot of advantages, having a changing location means that we need to sort out all the practicalities, like somewhere quiet to work or access to WiFi afresh each time. That’s a big change from having an office at which we convene and also means ensuring that we think about how to support the team as a group, taking into account individual needs. Some of the startup leaders I work with talk about how this degree of agility is difficult to make work in an equitable way and I found that the two days took more preparation than I had anticipated. As well as logistics, it is important that these days reflect our aims and values as an organisation. Inviting all staff to take part in the Board meeting is a good example of how we are trying to do this, but as well as time to work together, we also planned in time to eat and catch up informally and I felt those pockets of unstructured time were really important. This time, the Study, Museum of Manchester, became our work space for the day. Martin: The opportunity to work in new places is a nice feature of our approach, particularly when they are as nice as the Study. Thinking about the practicalities some thoughts that came to mind are with a team of 5, soon growing to 6, we are perhaps at the limits of places where it is easy to just turn up and get a seat. If I’ve got time before/after events or meetings in Edinburgh I’ll often go to the Dome on Potterrow, or when in Glasgow the Saltire Centre. These are great spaces but get very busy at times and you’d struggle to get more than 6 people around the same table. 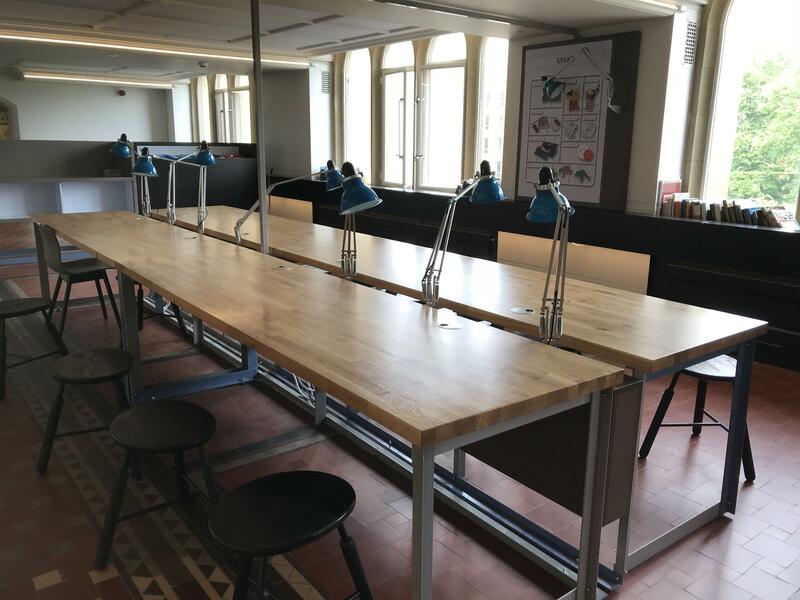 There however seems to be an explosion of affordable hot desking and meeting spaces, in particular, as part of start-up hubs. As a membership organisation there is also perhaps opportunities to combine visiting some of our Organisational Members and have some space for a team meeting. Combining the two could be interesting as it would let other members of the team see what we do. I suppose the danger of such an approach is the site visit becomes a distraction from getting team business done. Something else that came out of our meeting which I hadn’t really considered before is while I was happy and able to get up and leave for Manchester at 4:30am this might not be possible for everyone (plus getting home after 11:30pm because of delayed flights ain’t fun). Raises interesting questions about equitability. Maren: That’s true. As our team is distributed across the U.K. every location means longer travel times for someone. Achieving a balance between the flexibility of home working day to day and occasional travel whilst meeting our organisations’ needs can be a challenge. Organising the logistics is still a learning curve, but the other aspect I’d like to talk about is the actual work we did together. There were three parts to our day: first, the site visit which we all took part in and which helped us plan for the upcoming event. I think it was very useful to have everyone contribute ideas and ask questions on site and it saved us a lot of reporting back and another visit in the long run. Next, we spent some time together reviewing our project plan. We do review the plan regularly during our virtual team meetings, but it was insightful to do so in person as a team, seeing it projected on a big screen. For example, I noticed that we discussed more, asked more questions of each other. That continued when we spent time together working on different things after lunch. There was an opportunity for building rapport more informally that I hope will translate at least to some degree into our virtual collaboration. Two of our team had not met in person before, so that was an important function of the day, too. Martin: I agree that it felt like there was more collaboration and communication when we were working together in the same room. I think this underlines that it’s important to recognise there are differences between working as a distributed team rather than in a shared physical space. Until we all have a holodeck in our homes I don’t see this changing but it also is a reminder that we need to think about distributed teams differently and not just faithfully recreate the physical space online. This was captured a post by Noello Daley on ‘What Co-located Teams Can Learn From Remote Teams’. In particular, Noello highlighted “the importance of shifting not only process, but mindset”. Noello goes on to say that you should “shift from a local, spoken culture to a global, written culture”. I think ALT had a strong global written culture before become a distributed organisation so perhaps the difference is less apparent to me. The process and mindset is an interesting area. There is inevitably disruption in becoming a distributed team and in some ways you want to minimise this to allow people to adapt to a new working environment, the tension as a manager you don’t always want to continue old processes either because they are less efficient or don’t work in the new model. One of the challenges is something else Noello highlighted was in distributed teams there needs to be “empathy for each others’ needs”. This is something we have touched upon already. I feel part of the solution is also touched upon by Noello and mirrors our own blended approach: “plan to get together about four times per year. Use that time to re-establish team goals and culture”. Given the Manchester trip was an opportunity to share our individual perspectives of goals achieved to our Trustees and the process for identifying those goals was collaborative I think we should be having more staff days around Board meetings. Maren: I agree. Clearly our first attempt has highlighted how much potential these days have. But what about the day to day? Following on from the post by Noello you mention, I have been reflecting on how important it is to take some personal responsibility for what this recent article (found via @hopkinsdavid, thank you!) called ‘finding connection points’: the author suggests taking time to schedule regular lunches with co-workers, meet clients (Members, in our case) and getting involved in the community to ensure there is some face to face contact or at least time focused on building relationships. Some of this I would have previously thought about more in the context of CPD. As a small team we have long set up days to visit other organisations or Members to learn from and see how they do things, but in the context of operating as a virtual team, that’s taken on a different significance. Now it’s about making connecting with others an integral part of what we do as individuals, part of our professional practice. We can set an example and enable others, but to some extent it depends on how much an individual is willing to or interested in being part and contributing to that kind of working culture. Tech-focused solutions, like for example shared bookmarks, can help build a sense of shared space online. Yet it still depends on everyone contributing, everyone recognising the importance of working in a certain way and what benefits that has for us as a team and the organisation as a whole. In the last few hours of our team day we each prepared to talk to the Board about some key ways in which we have individually contributed to the success of the organisation in the past year and listening to that was probably the most powerful moment of the two days for me. We may not all be in the same place very often, but we are all part of the same vision and when we presented to each other I really felt that come across.